We began the holiday season this year with a visit from Alice, our older daughter who lives in our house in Oregon. Alice was more than ready to come see us after the ancient oil-burning basement furnace gave up the ghost just in time for the polar vortex of 2013. Alice farmed out the dog, arranged a schedule of daily human visitors for the cats, drained the pipes, and took off for sunny Africa. Alice arrived while I was still in Hong Kong, but her dad and sister kept her well entertained while I was away. We had a few days in Addis all together before heading out to meet up with the rest of the family in Berlin. Why Berlin, you ask? Especially in the middle of winter? 1. Christmas markets. If I was missing holiday spirit in Addis Ababa, there is plenty here for everyone. But best of all… we get to wear our silly hats! 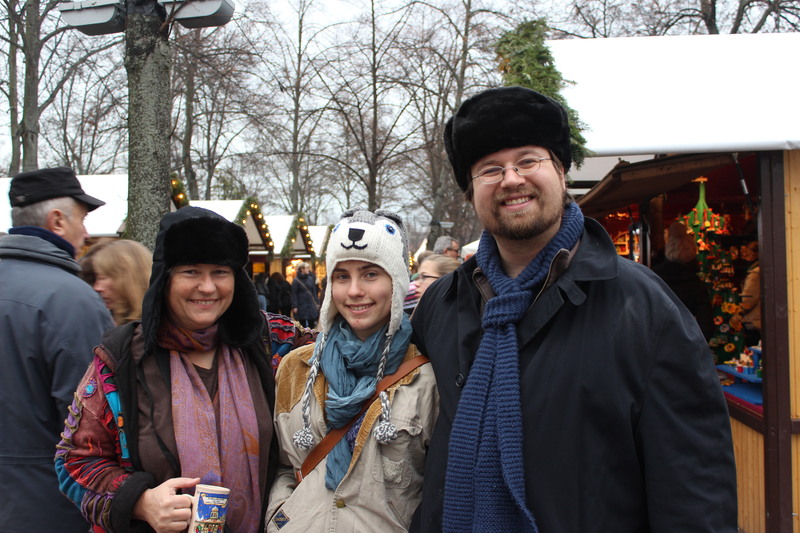 This entry was posted in Elsewhere, Family, Food and tagged Berlin, Christmas, Germany. Bookmark the permalink.